'Angel Island': Ellis Island Of The West Thousands of immigrants passed through California's Angel Island before entering the U.S. during the early 1900s — and few received a warm welcome. 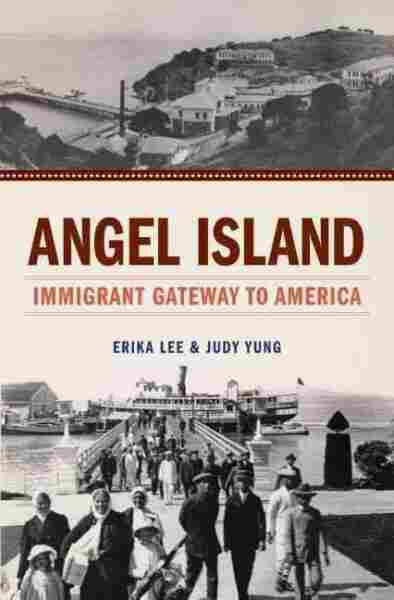 Historian Judy Yung shares her father's journey through the island and discusses her book, Angel Island: Immigrant Gateway to America. 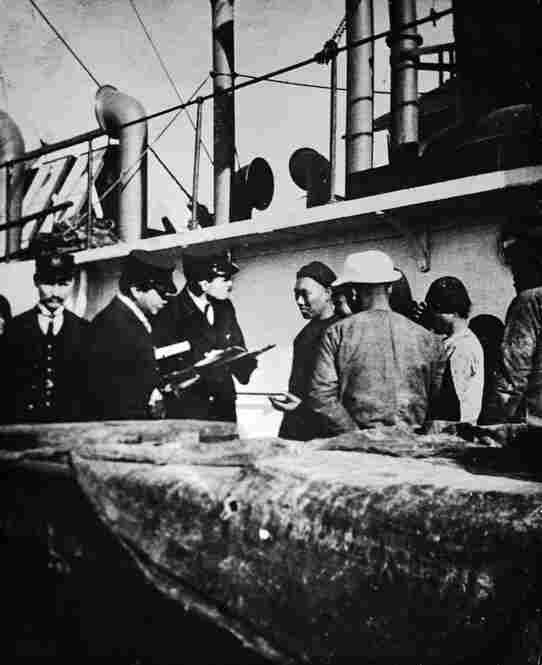 Immigration inspectors and an interpreter question Chinese immigrants arriving by ship in Portland, Ore., circa 1904-1910. Because the Chinese Exclusion Act of 1882 prohibited Chinese laborers from entering the United States, Chinese migrants were detained until their immigration status could be verified. 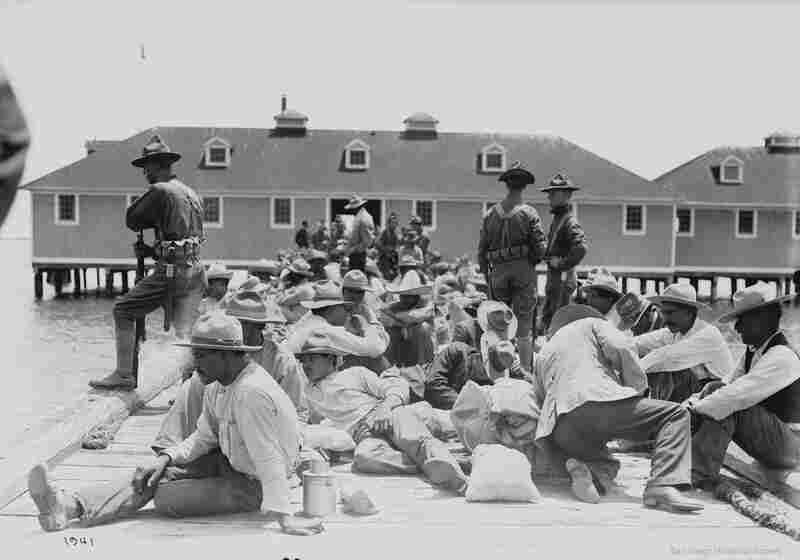 Mexican refugees on a dock under guard of U.S. soldiers, 1913. At least 400 Mexicans entered the United States via Angel Island during the Mexican Revolution. Of the 300,000 immigrants who passed through the Angel Island Immigration Station between 1910 and 1940, approximately 85,000 were Japanese. Fuku Terasawa was employed as a Japanese interpreter and matron at the station from 1912 to 1925. 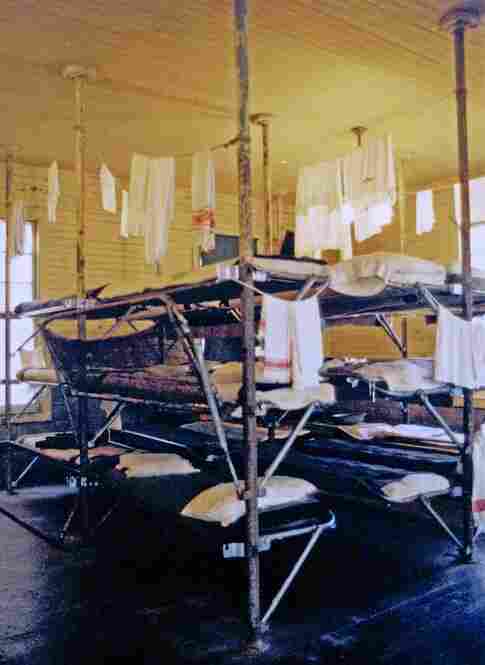 A photo of the refurbished women's quarters of the Angel Island Immigration Station's detention barracks, taken in the 1980s. 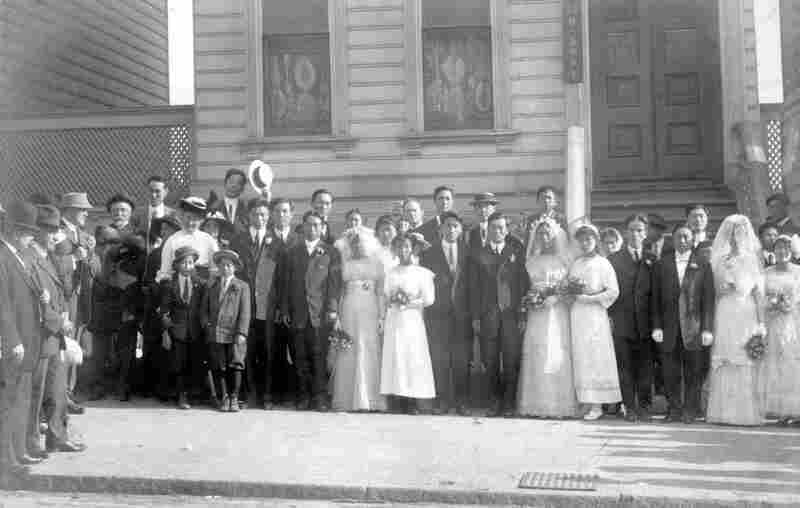 Newly married Korean couples pose in front of the Korean Methodist Church on San Francisco's Bush Street (date unknown). Many of the Korean immigrants passing through Angel Island were "picture brides," matched with Korean laborers working in the U.S. by matchmakers. Until 1917, picture brides were required to be remarried under U.S. law before being admitted to the country. 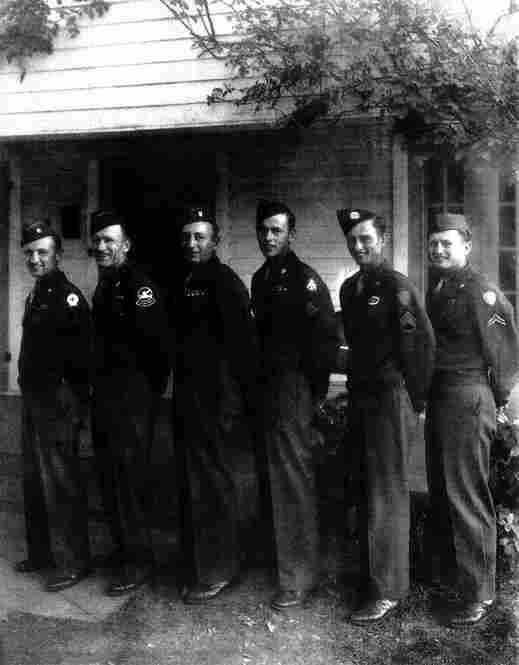 The Neufeld boys (from left to right) Frank, John, Jake, Bill, Dave and Abe, were among 250 Mennonites who fled Russia in 1929 after it came under Soviet rule. The brothers were so grateful to enter the U.S., they served in World War II even though it was forbidden by their religion. California's Angel Island is often called "the Ellis Island of the West." More than 300,000 people from 80 countries passed through the small immigration station off the San Francisco coast before entering the U.S. during the early 1900s. Few of the new arrivals received a warm welcome. Russians, Japanese, Australians, Chinese, Mexicans and many others found themselves in the island's detention barracks upon arrival. Among them was a poor, young Chinese man who crossed the Pacific under a false identity to start a new life in the United States. That man was historian Judy Yung's father. Yung shares her father's journey to America with NPR's Neal Conan and discusses her book, Angel Island: Immigrant Gateway to America. On January 22, 1910, thirty-year-old Wong Chung Hong arrived in San Francisco on the steamship China. A Chinese merchant with partnerships in a general merchandise store and a dried fruit business in and around Canton, Wong hoped to expand his business in the United States. But first he had to pass the U.S. government's immigrant inspection. He was ordered off the China and onto a U.S. government ferry that took him to the brand-new immigration station on Angel Island. One of nineteen immigration stations operating around the United States in the early twentieth century, the Angel Island Immigration Station was the main Pacific gateway into and out of the country. Wong gave the uniformed immigrant inspectors his documents and answered their questions. He presented his "section-six" certificate signed by the Chinese viceroy and the American consul general in Canton that verified his status as a merchant exempt from the Chinese exclusion laws. The photograph that was attached showed Wong dressed in richly embroidered Chinese robes, a clear marker of his wealth and status. He told Inspector Lorenzen that he was heading to Sang Wo & Co., a well-known Chinese grocery store in San Francisco's Chinatown and that he had $500 in U.S. currency with him. Wong's papers were all in order, and he made a good impression on U.S. immigration officials. Inspector Lauritz Lorenzen noted that the applicant's appearance was "conclusively" not that of a laborer, a class that was excluded from the country, and Wong was admitted into the United States three days later. He would be the first recorded person admitted into the country after being interviewed and detained on Angel Island. From 1910 to 1940, one million people were processed through the port of San Francisco on their way into or out of the country. These included over 341,000 aliens and returning residents and 209,000 U.S. citizens arriving in the United States. In addition, over 483,000 aliens and 183,000 U.S. citizens departed the country through San Francisco. Deportees, repatriates, alien stowaways, deserting seamen, and migrants in transit also arrived at and departed from San Francisco during the same time period. About half a million people entered or departed the country through Angel Island. Some, like Wong, were admitted within a few days. Others, like Esther and Catarino Lopez and their three young sons, were detained at the immigration station for months before being sent back home to Mexico. The Lopez family arrived on Angel Island three years after Wong Chung Hong. Unlike Wong, they were working class, and immigration officials unanimously voted to exclude the entire family on the grounds that they were "likely to become public charges." Commissioner of Immigration Samuel Backus argued that the aliens did not look fit to support themselves and presented "a very poor appearance." Catarino was "thin, scrawny-looking and not at all rugged." Esther was in her last trimester of pregnancy and presumably unable to work due to her "delicate condition." The children also looked "illy nourished and poorly developed." The family's relatives in Sacramento organized a defense, but after a month, the exclusion order remained in place. While still on Angel Island, Esther gave birth to twins at the immigration station hospital. Methodist missionary Katharine Maurer, known as the "angel of Angel Island," bought clothes for the two children and some gowns for Esther. They were "not the plainest I could find, for I knew how she would appreciate a bit of ribbon and embroidery," Maurer reported. Esther was indeed appreciative. She caressed the garments and profusely thanked Maurer. Two months later, she and her family were deported back to Mexico. The same year that the Lopezes were deported from Angel Island, six Korean students from Shanghai arrived at the immigration station seeking refuge in America from persecution by the Japanese in their colonized homeland. They had two strikes against them. They did not have the required Japanese passport or identification verifying their status as students, and they were found to be afflicted with hookworm, an excludable medical condition. However, their arrival had been preceded by a letter from the American consul in Shanghai to the secretary of state in Washington, D.C., recommending that, given their family wealth and strong opposition to Japan, they be given special consideration. In addition, they had the support of the Korean National Association, which was willing to guarantee their stay in America. They were treated for hookworm and were admitted one month later. Soto Shee was not so fortunate, and she received no special consideration on the island. She arrived at the immigration station from Hong Kong in late July of 1924 with her seven-month-old son, Soon Din. While in detention, Soon Din died suddenly. His body was brought to San Francisco for burial while Soto remained detained at the station. Distraught, she asked to be released from the immigration station on bond to be with her husband. Her attorney, Joseph P. Fallon, described his client's "very nervous state of health." But immigration officials in Washington, D.C., denied the request, finding "no unusual hardship." Three weeks later, in the middle of the night, Soto hanged herself in the women's bathroom. She would have died had Matron Grace McKeener not found her unconscious and taken her to the hospital. As she lay in recovery, Soto's husband and attorney Fallon renewed their calls for her to be admitted into the country. She was eventually allowed to leave the immigration station and enter the country temporarily on bond. Soto Shee would not have recognized Canadian Ivy Gidlow's description of the immigration station, and their experiences on the island were drastically different. 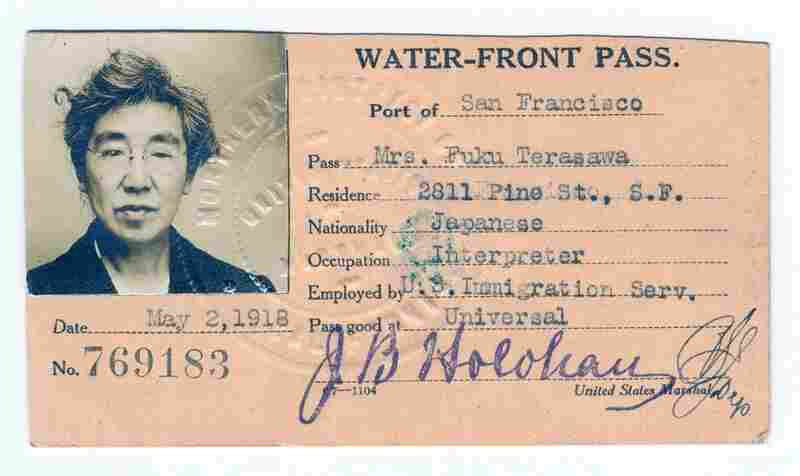 Detained briefly on Angel Island five years after Soto Shee, Gidlow sent her sister a letter describing her clean, white room, the colorful people she encountered in the dining halls, and the comforts of the immigration station. She could take a hot bath "whenever one pleases" and she enjoyed the well-stocked library immensely. "I am almost content here," she wrote. How did Wong Chung Hong, Esther Lopez, the four Korean students, Soto Shee, and Ivy Gidlow all end up on Angel Island? And why were their experiences at the immigration station so different? Angel Island: Immigrant Gateway to America explores the great diversity of immigrants who passed through America's Pacific gateway for the first time. Situated at the edge of the United States, the Angel Island Immigration Station was a place where global forces clashed with American national interests and identity. People from around the world were on the move as part of the era of global mass migration. Those seeking entry to the United States confronted U.S. immigration policies that treated immigrants differently based on their race, nationality, gender, and class as a way of identifying which ones were fit to enter the country and become Americans and which ones were not. These laws were just one part of a larger system of racial segregation and discrimination for immigrants and people of color in the United States during the twentieth century. The history of immigration on Angel Island illustrates the very real consequences that these policies had on immigrant lives and communities. But the significance of Angel Island's immigration history extends far beyond the island itself. The migration histories and experiences of the one million people who were processed through San Francisco and Angel Island reveals a world on the move and the making of America as both an inclusive nation of immigrants and an exclusive gatekeeping nation. Excerpted from Angel Island: Immigrant Gateway To America by Erika Lee and Judy Yung. Copyright 2010 by Erika Lee and Judy Yung. Excerpted by permission of Oxford University Press.